About the Book: Fat, striped, cheshire, or grumpy, this books offers more than 300 embroidery stitch patters for cat lovers. Each set of patterns offers a range of ideas in different styles, shapes, genres from simple to more complex. 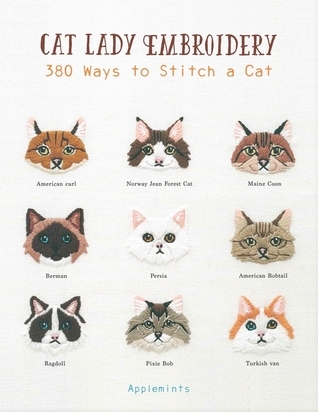 A purrfect book for embroidery beginners or those looking for fun and simple patterns. Original designs and clear instructions make this book a must have for any embroidery enthusiasts library. Do I Recommend this book? Oh yes!!! Notes and Opinions: If you are like me and obsessed with anything to do with cats, this book is for you. I'm always trying to find new things to do and make and this was totally perfect my DIY personality. Everything was basically laid out for you, so all you have to do is buy the supplies. The pictures are adorable ranging between realistic and cartoonish. I totally recommend this to anyone that's into this kind of stuff! !